No more guessing! 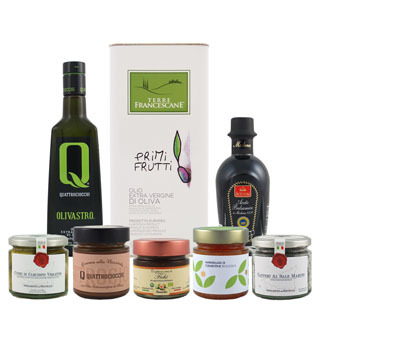 Discover your PALATE PROFILE with our new Olive Oil Lovers Tasting Kit and start buying oils you know you'll love. The Kit contains six small bottles of signature extra virgin olive oil, six tasting cups and a tasting placemat, but more importantly, we've designed an innovative online companion app to guide you through your tasting. Using the app, you will conduct a taste comparison of the oils within the kit to ultimately determine the type of oils that tantalizes your palate most, then use this information to shop for oils you know you’ll like. Oro del Desierto Arbequina: This organic extra virgin olive oil, pressed from 100% Arbequina variety olives, is a light fruity oil and light golden yellow in color. It’s known for its complex vegetal aroma with hints of ripe tropical fruits, banana, parsley and basil. Its taste is fine and strong with flavors of celery, lettuce and pine nut. Tagalakis Elaiones: This exquisite extra virgin olive oil is produced solely from Koroneiki variety olives grown in the renowned Messinia area of the Southern Peloponnese. Produced on a small family estate by the Tagalakis family, this extra virgin olive oil pairs beautifully with nearly any cuisine. Try it on grilled fish, garden tomato salads, broiled vegetables and legumes. Its incredibly well-balanced flavor also makes it the ideal oil for dressings, baking and sautéing. Frantoi Cutrera Gran Cru Nocellara del Belice: Made exclusively from Nocellara del Belice variety olives hand-harvested from mid-October through November in the areas of Partanna, Campobello de Mazzara and Castelvetrano in western Sicily. This mild intensity oil has aromas of freshly picked tomatoes and fresh vegetables with a subtle bitter finish. Oleoestepa Hojiblanca: Hojiblanca is one of the main variety of olives grown in the Estepa region of Southern Spain. It has a fruity intensity, which is typical of the variety, and an aroma reminiscent of fresh cut grass and apples. Its taste is moderately intense in bitter and spicy notes, making it a highly-prized oil for sauce-making and dressing grilled fish and salads. Oro Bailen Reserva Familiar Picual: A consistent front-runner on the international award-circuit, including the prestigious Mario Solinas awards, this is not your ordinary Picual. A truly outstanding oil in a first class of its own, this extra virgin olive oil is produced in the olive groves located in the foothills of the Sierra Morena, the northern mountain range in the province of Jaén. Harvested at the beginning of November at their optimal point of ripeness, this oil has exceptionally high organoleptic characteristics, making it stand out above other oils due to the intensity of its fruity flavor and the complexity of its aromas, which include tomato, apple, banana, green almond, fig and freshly cut grass. Herbaceous and fruity, it is an exceptional balance between bitter and spicy. Olio Quattrociocchi Moraiolo: Not for the faint of heart, this amazing organic extra virgin olive oil is powerful and pungent. Produced exclusively from organic Moraiolo variety olives, this oil is intense in fruitiness with complex notes of fresh-cut grass and artichoke with definite aromatic hints of mint, sage and basil. Its taste is strong, bitter and pungent and well-balanced throughout, an oil for the true connoisseur. Premium award-winning extra virgin olive oil from Valencia.